The Zakarpattia Oblast (Ukrainian: Закарпатська область, translit. Zakarpats’ka oblast’; see other languages) is an administrative oblast (province) located in southwestern Ukraine, coterminous with the historical region of Carpathian Ruthenia. Its administrative centre is the city of Uzhhorod. Other major cities within the oblast include Mukachevo, Khust, Berehove and Chop which is home to railroad transport infrastructure. Zakarpattia Oblast was established on 22 January 1946, after the resignation of Czechoslovakia on the territory of Subcarpathian Ruthenia (Czech: Podkarpatská Rus), annexed forcibly by the Soviet Union and attached to the Ukrainian Soviet Socialist Republic, under a treaty between Czechoslovakia and the Soviet Union. Some scholars say that during the Ukrainian independence referendum held in 1991, Zakarpattia Oblast voters were given a separate option on whether or not they favoured autonomy for the region. Although a large majority favoured autonomy, it was not granted. However, this referendum was about self-government status, not about autonomy (like in Crimea). Situated in the Carpathian Mountains of western Ukraine, Zakarpattia Oblast is the only Ukrainian administrative division which borders upon four countries: Poland, Slovakia, Hungary and Romania. The Carpathian Mountains play a major part in the oblast's economy, making the region an important tourist and travel destination housing many ski and spa resorts. With its almost 13,000 square kilometres (5,000 sq mi), the oblast is ranked 23rd by area and 15th by population as according to the 2001 Ukrainian Census, the population of Zakarpattia Oblast is 1,254,614. This total includes people of many different nationalities of which Hungarians, Romanians and Rusyns constitute significant minorities in some of the province's cities, while in others, they form the majority of the population (as in the case of Berehove). Rusyn: Подкарпатьска област, translit. Podkarpat’ska oblast. The coat of arms of Zakarpattia was originally created in the end of the 1910s in the then Czechoslovakia. The Zakarpattia Oblast has a total area of 12,800 km2 (4,942 sq mi) and is located on southwestern slopes and foothills of the Carpathian Mountains covering around 80% of area in the region. The rest of the region is covered by the Transcarpathian Lowland which is part of the Pannonian plain. Zakarpattia is the only Ukrainian oblast to have boundaries with four countries: Poland, Slovakia, Hungary and Romania. On the West it borders the Prešov and Košice Regions of Slovakia and Borsod-Abaúj-Zemplén and Szabolcs-Szatmár-Bereg Counties of Hungary, on the South—the Satu Mare and Maramureş Counties of Romania, on the East and Northeast—Ivano-Frankivsk Oblast, and on the North—Lviv Oblast and the Subcarpathian Voivodeship of Poland. The Zakarpattia Oblast mostly consists of mountains and small hills covered with deciduous and coniferous forests, as well as alpine meadows. Mountains cover about 80% of the oblast's area, and cross from North-East to South-East. The Primeval Beech Forests of the Carpathians, part of which are located within Zakarpattia Oblast, were recognized as a UNESCO World Heritage Site in 2007. The largest rivers that flow through the oblast include the Tysa, Borzhava, and the Tereblia. A high altitude lake is located in Rakhiv Raion, which is the highest in the region. It is called Nesamovyte. The lake is located in the Hoverla preserve on the slopes of Turkul mountain. The lake's area is 3,000 square metres (32,000 sq ft) and it is located 1,750 metres (5,740 ft) above sea level. The region's climate is moderate and continental with about 700–1,000 mm (28–39 in) of rainfall per year. The average temperature in summer is +21 °С (70 °F) and −4 °С (25 °F) in winter. With an elevation of 2,061 metres (6,762 ft) above sea level, Hoverla, part of the Chornohora mountain range, is the highest point in the oblast. The lowest point, 101 m (331 ft) above sea level, is located in the village of Ruski Heyevtsi (Oroszgejőc in Hungarian) in the Uzhhorodskyi Raion. Four of the oblast's historical-cultural sites were nominated for the Seven Wonders of Ukraine competition in 2007: Palanok Castle, Museum upon the Chorna River, Mykhailiv Orthodox Church, and the Nevytsky Castle. The lands of Transcarpathia were part of the Kingdom of Hungary since 895. In 895 the Hungarian tribes entered the Carpathian Basin from here through the Verecke pass. As such, it formed part of Austria-Hungary until the latter's demise at the end of World War I. It approximately consists of four Hungarian counties (comitatus): Bereg, Ung, Ugocsa and Maramaros. 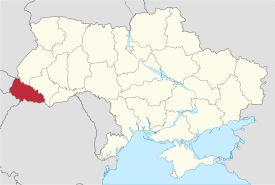 This region was briefly part of the short-lived West Ukrainian National Republic in 1918. The region was annexed by Romania by the end of that year, mostly the eastern portion such as Rakhiv and Khust. It was later recaptured by Hungarian Soviet Republic in the summer of 1919. Finally, under the name Subcarpathian Rus (Czech: Podkarpatská Rus), after the Paris Peace Conference of 1919 it was annexed to Czechoslovakia with a supposedly equal level of autonomy as Slovakia and Bohemia-Moravia-Czech Silesia (Czech lands). Nevertheless, such autonomy was granted as late as in 1938, after detrimental events of the Munich Conference; until then this land was administered directly from Prague by the government-appointed provincial presidents (zemští prezidenti) and/or elected governors (guvernéři). The province has a unique footnote in history as the only region in the former Czechoslovakia to have had an American governor: its first governor was Gregory Zatkovich, an American citizen who had earlier emigrated from the region and represented the Rusyn community in the U.S. Zatkovich was appointed governor by Czechoslovakia's first president, T. G. Masaryk in 1920, and served for about one year until he resigned over differences regarding the region's autonomy. Following the Munich Agreement, the southern part of the region was awarded to Hungary under the First Vienna Award in 1938. The remaining portion was constituted as an autonomous region of the short-lived Second Czechoslovak Republic. 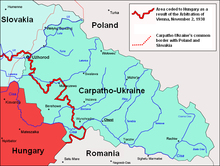 After the occupation of Bohemia and Moravia on March 15, 1939 and the Slovak declaration of an independent state, Carpatho-Ukraine was proclaimed as an independent Republic but was immediately occupied and later annexed by Hungary. Voloshyn asked support for recognition in advance from Hitler but he even did not answer. The state is known as 'the one-day republic' because it did not exist more than one day. The military operations and the occupation of Carpatho-Ukraine was finished by the Hungarian troops on March 18. The Hungarian invasion was followed by a few weeks of terror in which more than 27,000 people were shot dead without trial and investigation. Over 75,000 Ukrainians decided to seek asylum in the USSR; of those almost 60,000 of them died in Gulag prison-camps. Others joined the Czechoslovak Army. The major Jewish communities of the region had existed in Mukachevo, Ungvar, and Khust. During the German occupation of Hungary [March 1944-December 1944] , almost the entire Jewish population was deported; few survived the Holocaust. In October 1944 the Sub-Carpathian Ukraine was occupied by the Red Army. On 26 November 1944 in Mukacheve took place the First Congress of People's Committees of Zakarpattia Ukraine, elections to which took place in November 10-25, 1944. In June 29, 1945, Czechoslovak President Edvard Beneš signed a treaty ceding the area and the next month it was united with the Ukrainian SSR through the "Manifest for unification with the Soviet Ukraine" that was accepted by the 1st Congress of People's Committees of Sub-Carpathian Ukraine without any knowledge of common people. It was then annexed into the Ukrainian SSR as Zakarpattia Oblast. After the break-up of the Soviet Union, it became part of independent Ukraine. After the fall of the Soviet Union in 1991, Ukraine held an independence referendum in which the residents of Zakarpattia were asked about the Zakarpattia Oblast Council's proposal for self-rule. About 78% of the oblast's population voted in favour of autonomy; however, it was not granted. There were also propositions of separating from Ukraine to rejoin Czechoslovakia, but after Czechoslovakia's dissolution into the Czech Republic and the Slovak Republic (1993), these ideas have been rendered largely moot. On October 25, 2008, delegates to the Congress of Carpathian Ruthenians declared the formation of the Republic of Carpathian Ruthenia. The prosecutor’s office of Zakarpattia region has filed a case against Russian Orthodox Church priest Dmytro Sidor and Yevhen Zhupan, an Our Ukraine party deputy of the Zakarpattia regional council and chairman of the People’s Council of Ruthenians, on charges of encroaching on the territorial integrity and inviolability of Ukraine. Zakarpattia Oblast's local administration is controlled by the Zakarpattia Oblast Council (rada). The oblast's governor (since July 2015 Hennadiy Moskal) is appointed by the President of Ukraine. Zakarpattia Oblast is administratively subdivided into 13 raions (districts), as well as 5 cities (municipalities) which are directly subordinate to the oblast government: Berehove, Chop, Khust, Mukachevo, and the administrative centre of the oblast, Uzhhorod. There are a total of 7 cities, 19 towns, and more than 579 villages. The oblast (region) is divided into 13 raions and five cities of regional importance including the administrative centre Uzhhorod. Administrative centres of raions may be located within a city of regional importance, while such city is not technically a part of the raion. A city of regional significance may consists of an individual populated place or be complex of several settlements (the city proper and suburbs) which are governed by own radas (councils). Further each raion divided into radas (councils). Cities and towns (urban type settlements) all have own individual councils, while villages and rural settlements may be formed into multiple settlements councils or an individual village council. All cities are either of regional importance or of district importance. Ethnic map of Zakarpattia Oblast in 2001. Languages of Zakarpattia Oblast in 2001. According to the 2001 Ukrainian Census, the population of Zakarpattia Oblast is 1,254,614. The current estimated population is 1,259,158 (2016 est.). With the comparison of the last official Soviet Census of 1989 the total population grew by 0.7%. Out of 1,010,100 Ukrainians in the region, 99.2% (~1,002,019) identified their native language as Ukrainian, while about 0.5% (~5,051) consider their native language to be Russian. Out of 151,500 Hungarians, 97.1% (~147,107) consider their native language to be Hungarian, while about 2.6% (~3,939) consider their native language to be Ukrainian. Out of 32,100 Romanians, 99.1% (31,811) identified their native language to be Romanian, while 0.6% (~193) consider their language Ukrainian. Out of 31,000 Russians, 91.6% (28,396) identified their native language as Russian, while 8.1% (~2,511) consider their language Ukrainian. Out of 14,000 Romani peoples only 20.7% (2,898) identify their native language as Romani, while 62.9% (~8,806) consider their language Ukrainian or Russian. Out of 5,600 Slovaks 43.9% (2,458) identify their native language as Slovak, while 42.1% (~2,358) consider their language Ukrainian. Out of 3,500 Germans, 50.0% (1,750) acknowledge their native language, while 38.9% (~1,362) consider their language Ukrainian. About 81% of the oblast population considers the Ukrainian language their native language, while 12.7% of population gives consideration to the Hungarian language and just over 5% considers either the Russian or Romanian languages. Around two thirds are Eastern Orthodox and around 25% Catholic. The largest denomination is the Ukrainian Orthodox Church of the Kyivan Patriarchate, followed by the Ukrainian Orthodox Church of the Moscow Patriarchate and the Ruthenian Greek Catholic Church. Smaller religious groups include Roman Catholics and Protestants, which are largely associated with minority groups; Roman Catholics and Protestants tend to be Hungarian or local Ruthenian. Zakarpattia is home to approximately 14,000 ethnic Roma (Gypsies), the highest proportion of Roma in any oblast in Ukraine. The first Hungarian College in Ukraine is in Berehovo, the II. Rákoczi Ferenc College. Beside the major ethnic groups, Zakarpattia is home to several ethnic sub-groups such as Boykos, Lemky, Hutsuls, and others. According to a 2015 survey, 68% of the population of Zakarpattia Oblast adheres to Eastern Orthodoxy, while 19% are followers of the Ruthenian Greek Catholic Church and 7% are Roman Catholics. Protestants and unaffiliated generic Christians make up 1% and 3% of the population respectively. Only one percent of the population does not follow any religion. Situated in the Carpathian Mountains, Zakarpattia Oblast's economy depends mostly on trans-border trade, vinery and forestry. The oblast is also home to a special economic zone. The oblast's main industry includes woodworking. Other industries include food, light industry, and mechanical engineering. The foodstuffs segment in the structure of ware production of national consumption is 45%. The total number of large industrial organisations is 319, compared to 733 small industrial organisations. ^ a b "Mukachivskyi Raion: Social data". Zakarpattia Oblast Administration. Retrieved 2007-06-02. ^ a b c d Magocsi, Paul Robert (2007). Ukraine: An Illustrated History. Seattle: University of Washington Press. ISBN 0-295-98723-5. ^ Kuzio, Taras. "The Rusyn Question in Ukraine: sorting out fact from fiction". Canadian Review of Studies in Nationalism. XXXII (2005). ^ "The name "Kárpátalja", as it appears on the cover of the journal of the Transcarpathian section of the Hungarian Writers' Union" (PDF). Retrieved 2014-03-02. ^ "Christian Pischlöger: Kárpátalja vagy Kárpátontúl? College of Nyíregyháza" (PDF). Retrieved 2014-03-02. ^ a b c d "Geography". Zakarpattia Oblast Council (in Ukrainian). Retrieved 2007-11-18. ^ a b c d e f "Zakarpattya Region". Cabinet of Ministers of Ukraine. Retrieved 2007-06-01. ^ a b "Transcarpathia is my region". All Zakarpattya. Archived from the original on 2007-04-04. Retrieved 2007-06-01. ^ "Primeval Beech Forests of the Carpathians". UNESCO World Heritage Centre. Retrieved 2007-07-04. ^ Subtelny, Orest (2000). Ukraine: A History. University of Toronto Press. p. 448. ISBN 0-8020-8390-0. ^ Paul Robert Magocsi (30 November 2015). 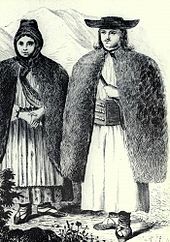 With Their Backs to the Mountains: A History of Carpathian Rus? and Carpatho-Rusyns. Central European University Press. p. 197. ISBN 978-615-5053-46-7. ^ a b "History of the region". All Zakarpattya. Archived from the original on 2007-04-04. Retrieved 2007-06-01. ^ First Congress of People's Committees of Zakarpattia Ukraine (ПЕРШИЙ З'ЇЗД НАРОДНИХ КОМІТЕТІВ ЗАКАРПАТСЬКОЇ УКРАЇНИ). Ukrainian Soviet Encyclopedia. ^ "Svoboda Party Calls On SBU To Launch Criminal Case Against Delegates To Congress Of Carpathian Ruthenians For Declaring Carpathian Ruthenia Republic". Archived from the original on 2008-10-29. Retrieved 2008-11-06. ^ a b "Regions of Ukraine / Zakarpattia region". 2001 Ukrainian Census. Retrieved 2007-06-01. ^ a b "General results of the census / National composition of population / Zakarpattia region". 2001 Ukrainian Census. Retrieved 2013-01-28. ^ "General results of the census / National composition of population / Zakarpattia region". 2001 Ukrainian Census (in Ukrainian). Archived from the original on 2009-04-30. Retrieved 2007-06-03. ^ a b c "Релігійні вподобання населення України". infolight.org.ua. 26 May 2015. Retrieved 13 March 2018. ^ "Regions of Ukraine / Results of the census". 2001 Ukrainian Census (in Ukrainian). Retrieved 2007-06-03. ^ "History of the Region". World Gazetteer. Archived from the original on 2007-04-04. Retrieved 2007-06-01.